Production designer Dan Hennah and Weta Digital's Joe Letteri spoke to The New York Times' Mekado Murphy about the production design of The Hobbit movies. 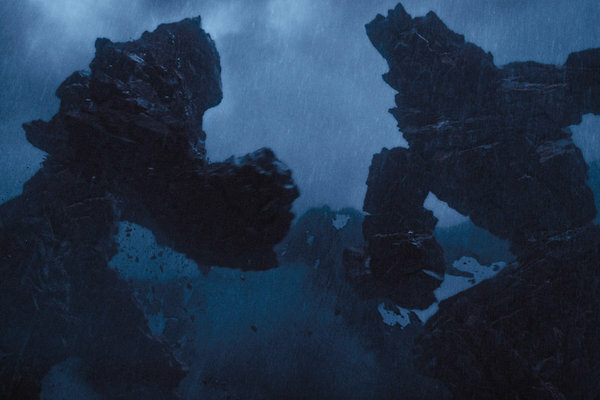 If you noticed while you were watching, there were several scene that required a lot of CGI, particularly the Stone Giants sequence. This scene was mostly composed of computer-generated imagery, which was all based upon real locations in the Southern Alps of New Zealand. The crew built several different sets to film the sequence, complete with rain and rubber rocks. When the filming was done, they merged the real with the unreal. You can read more about this and about the creation of the the goblin caves by clicking on this link.